In the Central African Republic, the U.N. High Commissioner for Refugees (UNHCR) reported that the conflict there has resulted in more than 226,000 refugees and third-country nationals fleeing the country since December 2013. The United Nations for its part has found “ample evidence” of war crimes. One of the victims, a seven-year-old boy named Ibrahim, left for dead by militiamen, survived a machete wound that exposed bone and part of his brain. Miraculously, Ibrahim escaped permanent brain damage, though he will bear the machete’s mark for the rest of his life. In Europe, attempted migration across the Mediterranean Sea has become a problem widely acknowledged to be reaching dire proportions. Indeed, Pope Francis chose to highlight the issue on his first pastoral visit outside Rome to the island of Lampedusa, where he urged international rejection of the “globalization of indifference” manifested in the ongoing tragedy of migrants dying at sea in search of refuge. But while the president should be commended for calling this what it is, namely a humanitarian crisis, these developments are symptomatic of a deeper problem. The reality is that the broken U.S. immigration system has played a critical role in dividing these families in the first place. The securitization of the southwestern border by the U.S. government has made it at once both more perilous and more costly to migrate, and most of those fleeing generalized violence simply won’t be able to fulfill strict U.S. asylum requirements. Moreover, recent mass deportations of undocumented migrants – occurring at a rate nine times higher than that of twenty years ago – have divided more than one million families who now lead lives separated from loved ones. Since October 2011, U.S. Customs and Border Protection has reported a striking increase in the number of apprehensions of unaccompanied and separated children from El Salvador, Guatemala, Honduras, and Mexico. One third of apprehended children interviewed by UNHCR said they were crossing to meet one or both of their parents now living in the United States. Remarkably, the organization found that a majority of these children were in need of international legal protection. As a result, UNHCR concluded that all unaccompanied and separated children from these countries should receive screening to determine whether they have recourse to such protection. This finding is as clear as it is unequivocal: the southwestern border of the United States is now the site of a genuine humanitarian emergency, and many seeking refuge are children lacking the protection not only of their parents, but of their state. First, the United States has a legal obligation to abide by Article 33 of the U.N. Refugee Convention, which prohibits forcibly returning refugees to their country of origin. Article 33 is the keystone of the entire international policy architecture of refugee protection, and its violation risks the integrity of the system itself. Second, U.S. policymakers must recognize that the migration flow across the country’s southwestern border is intrinsically mixed, and includes unaccompanied minors and others with international protection needs. Third, the United States should work more aggressively through bilateral and multilateral partnerships to guarantee that displaced persons with genuine protection needs are identified and provided with a safe haven. Such efforts should be founded upon – and not merely substitute for – successfully passing comprehensive immigration reform founded upon the human dignity of the migrant. On this World Refugee Day, then, the United States would do well to underscore its commitment to fundamental human rights by recognizing that refugee policy, as with all foreign policy, begins at home. United Nations failed – Kin Ban Moon should step down. We want peace – no refugees. I agree, UN failed. The U.S., Great Britain and France sorely need to quit interfering in the Middle East and let things there take their course! I agree with this. However, left- and right-wingers in the US, Britain, and France will always push for progressive, expensive, and failed foreign policies. Not a real Joey post above. I'm sorry about the refuges but I am in a sink hole in ohio. Use that device to summon help instead of complaining on blogs. Hurry! That battery won't last long. Been here since yesterday past out. last thing I remember was I over limed my margarita then we–my car and me-fell in a sink hole. Sigh, last year was Wyoming. I'm hungry. I saw the word turkey above. I know its about the country but now i want a roasted oven turkey with swiss on toasted wheat bread. Wow! Its true! You cant teach an old dog new tricks. But us cats are a different story. That's why we love cats. @bobcat good to see you. @chrissy, I wasn't going to attempt that spelling. You got it right. SSDD as usual. Lol @ dazzle doncha mean whyoming? Lmao i think hes mispelling sinkhole this time...its really spelled sh!thole lol. When exactly did rupert get rescued from last years sinkhole ? I just figured everyone had wrote him off as a lost cause. Regarding the US portion of the author's post...it is a crisis because it involves children. The countries of origin and the countries that allowed these children to transit through their territories should be the subject of the author's and the UN's scrutiny – not the US. If the U.S. can spend money on all these useless and unnecessary wars, surely it can do something for these children, Retired Military. You are ignoring the problem. The issue is the continuation of illegal immigration following into our country. The UN, which we are by far the majority funder of its budget, should get involved in the process before these children get to our boarders. If they are so concerned they should take action instead of waiting and blaming our immigration laws. That is counterintuitive and typical. Agreed @ Retired Military! We should provide humanitarian aid only! And good one @ banasy lol. And @ bobcat thats when he changed his name from little mister to rupert. Mustve reincarnated i guess lol. His spelling of Wyoming. You remembered. He's liable to use any name as long as it's someone else's. Lol when rupert gets swallowed up by the craphole he'll come back as milton or buford or some other rarely used name @ dazzle! 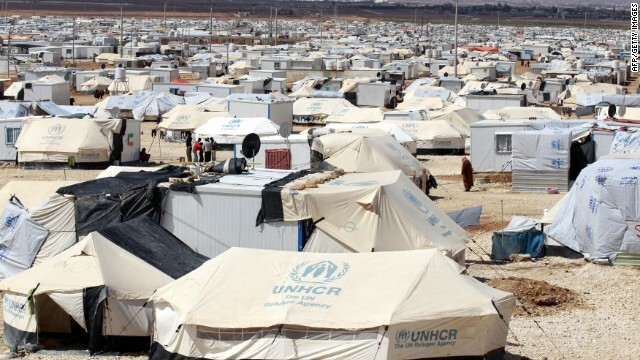 A recent UN report placed the figure of displaced people around the world to be at 50 million. That is amazing... Majority of it is caused by poverty and some of it by sectarian strife. Of course, the UN has to get more involved and help these people, but we must also try to fix the underlying problem: Poverty and corruption. Wow! I just read the 15 page story on the homepage on refugees trying to enter our country illegally! If that doesnt affect you then you have a heart of stone! While many people in this country have become a bunch of priveleged brats there are people who are truly suffering! Next time you hear someone whining about not having the latest smartphone remind them we have people comming here that have endured REAL suffering and would be most greatful for a pack of ramen noodles!!! And these big manufacturing companies sending work outside the country...why dont you send it to places like quatamala where you would at least be doing a good thing besides getting richer! If you dont give a damn about your own country show you give a damn about SOMETHING WORTHWHILE! Chrissy: these stories are heart wrenching. But we are broke as a nation. The US has the highest corporate tax rate. That is one of the reasons US companies are moving out of the country. They are in business to make a profit – that is why they exist. California is seeing a mass exodus of businesses from its state for the same reason. Our governent has a spending problem, not one of revenue deficit. if the government would ease the tax burden on businesses they wouuld have the funds for recapitalization, expansion and hiring. The higher taxes cut into profit which stifles economic growth. Companies are not in business to support a government that cannot control its spending, much less one that cannot establish a budget. Dem or Rep led, we must determine what is in our best national interest. One can debate the cost of $$ spent on the military and these lng wars, that is legitimate. But there is definitely huge waste, fraud and abuse of tax payer dollars within govt. Im ignoring nothing! And funny thing about these corporations...ever since they have started outsourcing manufacturing my stocks in an electronics corp have done nothing but drop! So no im not ignoring anything. And if this country didnt continuelly promote itself as the greatest country on earth maybe people wouldnt be trying to come here...legally or not! Careful what you ask for! Chrissy: Looking back at the posts, I told George Patton he was "ignoring" the main issue, which is illegal immigration. Wasn't replying to you. And with the present warmongers in Congress the majority of our taxdollars goes into a military budget and meanwhile these lazy, high end welfare recipients (congress~both parties) do NOTHING to reform imigration!!! So youre saying there is no waste concerning the military and the budget? Thats BS! Half of my family is and were veterans! My father died recently because of the VA medical process!! Yet they are getting big bonuses! Bonus for what? Ignoring our veterans medical problems? And what about all the homeless vets? Why doesnt the military budget take care of these issues? Chrissy: Didn't say that. I said the $$ spent in military funding us a legitimate debate to have. The VA issue is criminal and all who knowingly participated should face criminal prosecution, now matter where the trail leads. The money spent on illegal immigrants could be spent on tax paying veterans. Among questions raised concerning refugee children, I failed to see a question of the morality of going birth to a child that the parents do not know they can feed, house, and educate. I think that reproduction without resources for raising children is immoral. If the reason for parents' inability to raise children is the country of residence, the reproduction is not more moral. That the responsibility of raising the children should then fall upon the citizens of the USA is irrational. Really? And how immoral is it to watch children suffer from starvation and crime just to feel righteous? These kids are victims of circ umstance that theyve had no part of!!!! Not to mention many of them are suffering because of the greed of warmongers and those that condone them!!! While their bank accounts grow and grow! Disgusting! Doing a morally right thing, such as not reproducing a child that one cannot support, is unrelated to whether someone else supports it or not. One advocates morality for the good of human beings, not to feel righteous. Many of these displaced children are not abandoned by their parents. Often, they are orphans, or live in an area subject to extreme violence by gangs and/or cartels. Many would qualify for asylum were they adults. They are leaving their birth countries to TRY TO SAVE THEIR LIVES. It isn't about whether their parents could "afford" to have children or not. If Article 33 of the U.N. Refugee Convention places a disproportionate burden on the USA, it is not the responsibility of the USA to adapt its laws to suit the almost useless United Nations. It is the problem of the United Nations, which can easily gain relief by the amendment of its Article 33. Yea ok sweep it under the rug just so you can sleep at night more power to you! Someone elses problem! Except if WE are the root cause because we cant stop our infinite desire to controll every other countries governmental issues! No, a national desire for control is not our problem. In this instance, the reality is simply that the USA cannot afford to support every poor person in the world. It would be nice if we could, but we can't. Perhaps it's because we try to "support" them rather than assist in initiating policies to make their lives better through influence on the governmental level. We CANT afford to start all these damn wars either but that sure doesnt stop us any!!! And yea control isnt our problem...because these warmongering egotrippingmaniacs in Congress have shown us repeatedly that they CANT control their own greedy ways!! I'm glad that another writer mentioned that USA companies are in business to make a profit. That is a fortunate fact. And as i ALREADY STATED @ Joey its quite odd that their stockholders are LOSING money since they began outsourcing! But hey im glad you can continue to have your champaine parties and not be interupted with no starving refugees!!! Yes it could! If CONGRESS would get off their lazy collective butts and REFORM immigration!! I work with homeless vets regularly trying to find solutions for their demise! Its shameful to me that this country continues to produce them and DOESNT do a damn thing to find a solution! In fact they try to rush their last lease on life!!! I know you're a veteran and i appreciate your service to us, the citizens....but dont you find it a little disturbing that some of these "elected clowns" want to jump in whatever conflict they can latch unto? With absolutely no regard of people that, at the end of the day, suffer the most! ALL IN THE NAME OF MONEY! @chri§§y: I agree completely. If the US government had spent the money on fighting poverty and helping the poor instead of funding the war machine, then perhaps the US would've been seen as a beacon of light and good that it was originally meant to be. Instead, what we see is a bunch of greedy politicians war mongering and talking about "imminent threat" that really doesn't exist. The only reason other countries hate the US or intend harm is due to these dumb wars that the US has engaged in in the first place. Wars breed suffering, poverty, violence, hatred and bring out the worst in humanity. Ok your post @ 1:13 i thought was a response to my prior post so i apologise! Over the past several months ive gotten alot of flack about my opinion on the homeless, particularly homeless veterans., on these blogs! I feel very strongly about that disgusting part of our society, that can be so flip about it! And the response that they are lazy and want handouts pizzes me off to no end!